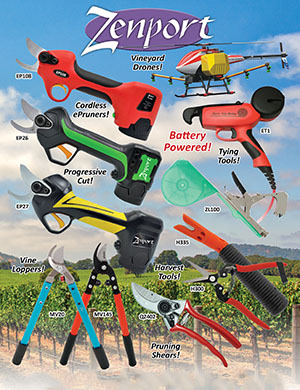 The Zenport Lopper MV20 20-inch vine and light tree lopper has blades and hooks that are designed specifically for work in the vineyard. The blade is slightly narrower than typical to ease work in tight spots, and the hook holds the material firmly in place to ensure smooth professional cuts. The special alloy FORGED steel is heat treated and tempered to produce an edge that stays sharp longer. The poly bumper is a great shock absorber, and the trouble free center bolt eliminates adjustment problems. Handles are made of tough ultra-light aluminum alloy. Zenport MV145/MV150 20-inch and 24-inch professional vine and light tree loppers for vineyard, orchard and shrub is a flat-blade model that is widely used by professional vineyard pruners as well as home gardeners for grape, shrub and tree pruning. The swivel head bolt and nylon-padded nut ensure smooth and lasting operation. Rubber bumpers absorb the shock on completion of cut. The Zenport MV20 20-inch vine and light tree lopper has blades and hooks that are designed specifically for work in the vineyard. The blade is slightly narrower than typical to ease work in tight spots, and the hook holds the material firmly in place to ensure smooth professional cuts. The special alloy FORGED steel is heat treated and tempered to produce an edge that stays sharp longer. The poly bumper is a great shock absorber, and the trouble free center bolt eliminates adjustment problems. Handles are made of tough ultra-light aluminum alloy.